Smokeless tobacco products from rural India with differing health warning label (HWL) printing manipulations. 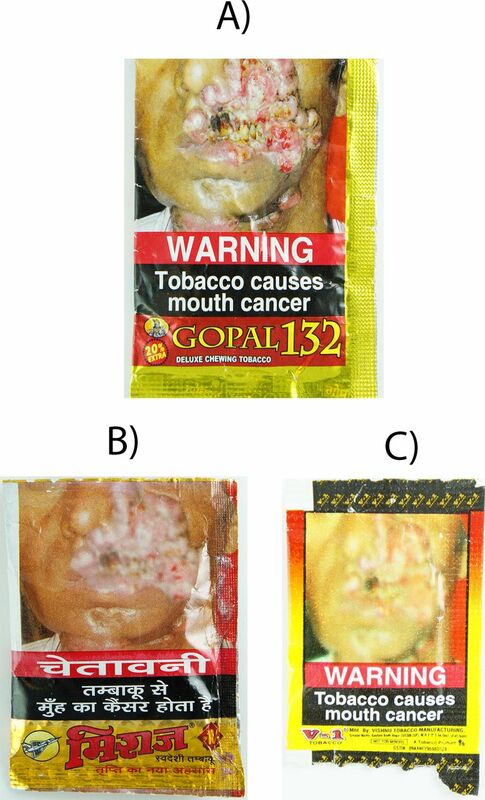 (A) A HWL that is accurately printed, as prescribed by India law; (B) a HWL where the mouth cancer is selectively blurred, maintaining visual clarity for the remaining parts of the HWL; and (C) a HWL that is completely blurred, with sharp text and branding, suggesting these tobacco manufacturers have the ability to print clear packaging. Although the Indian law exceeds many of the HWL guidelines in the WHO-FCTC, this deficit in effectual implementation diminishes the ability of HWLs to communicate the health risks of SLT products. We identified a need for regular monitoring of HWLs for accurate printing, with fidelity to the Ministry of Health and Family Welfare templates. Given the widespread burden of SLT use, particularly in rural areas, this should be a priority in India. We acknowledge and thank Healis Sekhsaria Institute for Public Health who collected these data under the overall supervision of Dr Prakash C Gupta and coordinated by Dr Namrata Puntambekar. Global Adult Tobacco Survey (GATS). Fact Sheet India: 2016-2017. Geneva, Switzerland: World Health Organization. https://mohfw.gov.in/sites/default/files/GATS-2%20FactSheet.pdf. (accessed 30 May 2018). Tobacco Pack Surveillance System (TPackSS). Pack Search.Baltimore, MD: Johns Hopkins Bloomberg School of Public Health. Tobacco Pack Surveillance System (TPacKSS).TPackSS Smokeless and Bidi Tobacco Field Collection Protocol. Baltimore, MD:Johns Hopkins Bloomberg School of Public Health. https://globaltobaccocontrol.org/tpackss/sites/default/files/2017_India%20SLT_Bidi_Field_Protocol_FINAL.pdf (accessed 10 Dec 2018). Ministry of Home Affairs. A-4 Towns and Urban Agglomerations Classified by Population Size Class in 2011: Government of India. http://www.censusindia.gov.in/2011census/PCA/A4.html. (accessed 30 May 2018). Tobacco Pack Surveillance System (TPackSS). Health Warning Label Compliance: India-2016 [Fact sheet].Baltimore, MD: Johns Hopkins Bloomberg School of Public Health. https://globaltobaccocontrol.org/tpackss/sites/default/files/tpackss_indiawave2_healthwarning_06_28_18.pdf (accessed 27 Nov 2018). Tobacco Pack Surveillance System (TPackSS). Smokeless Tobacco Health Warning Label Compliance: India-2016. Baltimore, MD: Johns Hopkins Bloomberg School of Public Health. https://www.globaltobaccocontrol.org/tpackss/sites/default/files/tpackss_smokeless_HWL_10_22_2018.pdf (accessed 27 Nov 2018). National Literacy Mission – India. Literates and Literacy Rates-2001 Census (Provisional). http://www.nlm.nic.in/literacy01_nlm.htm (accessed 30 May 2018). World Health Organization. Guidelines for Implementation of Article 11 of the WHO Framework Convention on Tobacco Control (Packaging and labelling of tobacco products: World Health Organization, 2008. Contributors MI was the primary writer of the article. All authors contributed to revising the article critically for important intellectual content. All authors approved of the final version of the paper. Funding This work was supported with funding from Bloomberg Philanthropies’ Bloomberg Initiative to Reduce Tobacco Use (www.bloomberg.org).